Are you and the kids melting under a summer heat wave? Harness the power of the sun with this creative hot weather science experiment for kids! Set-up is a breeze, and there is little-to-know clean-up. This science experiment gets kids thinking about alternative energy sources. Make crayons in any shape you like – the options are endless! 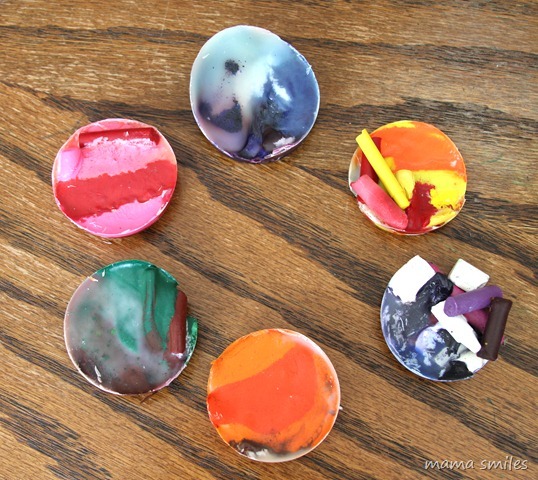 Silicone molds are wonderful for making shaped crayons using this method. Note that the silicone is insulated, so you may need hotter weather for it to work. A car dashboard is an easy way to create more heat! Hot Weather Science Magic for Kids – Get Creative! I had this activity on our to-try list last year, but Massachusetts never got very hot. This summer has been plenty hot, so I thought we’d give it a try. We cut the tops off of some plastic cups, added pieces of crayons, put everything in some left over aluminum foil. We covered it with plastic wrap at the suggestion of my mechanical engineer brother, who happened to be visiting when I decided to try this. I didn’t try it on the hottest day – temperatures were low nineties, and some of the crayons didn’t melt. I think they were from the cups that wound up partially in the shade, and I think they were also washable and twist-up crayon pieces, which may have affected our results. We used Dixie cups for this experiment because that is what we had lying around, but there are many ways to get creative with this experiment! Silicone molds make it possible to create these crayons in virtually any shape imaginable. These LEGO molds are favorites with our kids! No heat wave? 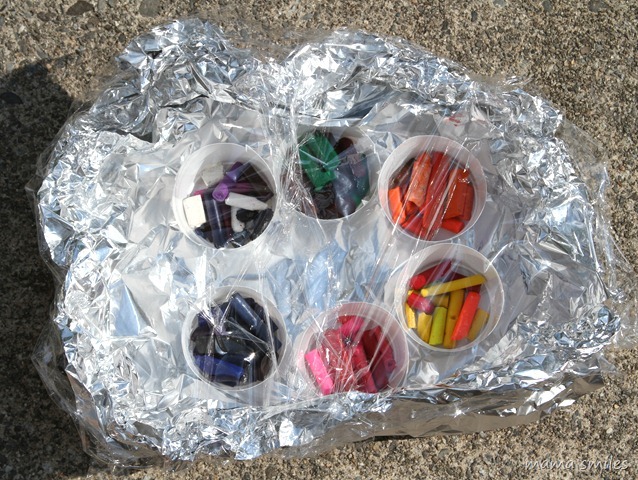 Follow these instructions for using silicone molds to make crayons in any weather! Great idea! I’ve been thinking of doing some more sun-powered activities, too. .-= Jaimie´s last blog ..The Tomorrows Outfit Clothesline- My New Trick for Avoiding Morning Drama =-. Yeah, 113 degree heat index here yesterday and today–we are doing this today! Again, awesome idea from you:-). Thank you! .-= Susana´s last blog ..How To Eat An Ice Cream Coneby Jack =-. That’s a great idea. 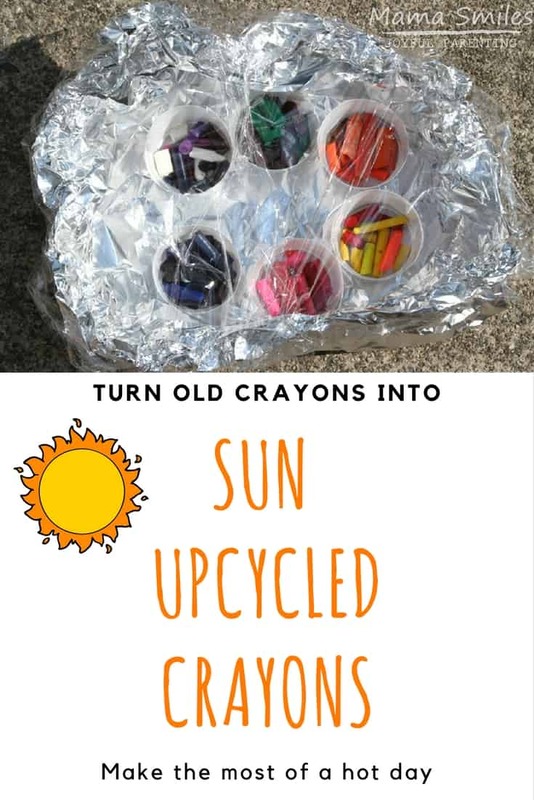 We have tons of crayon pieces, so this would be a fun way to use them. .-= Quadmama´s last blog ..No Evil Stepmother in This Story =-. .-= Natalie´s last blog ..Drive =-. These are beautiful! I would frame them as works of art. But I guess they’ll be more useful in creating even more works of art! .-= Elisa | blissfulE´s last blog ..the pen-scoop method =-. As hot as it’s been here, I do believe I’m going to try this. Have to get some dixie cups, but have everything else. Thanks for sharing, awesome! I just saw a melted crayon in the parking lot at our local grocery store, and thought “Hmmm … fodder for a project?” and then forgot all about it! Thanks for the reminder! 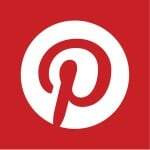 .-= Sadia´s last blog ..Pampering =-. .-= twolittleseeds´s last blog ..5 Things To Do With Blackcurrants In A Day =-. I keep meaning to do this, but haven’t followed through yet. Now I know I can do it outside. .-= Ticia´s last blog ..Outstanding Blogger Award =-. I’ve done this in the oven in a muffin tin but never outside in the sun. Thanks for a great idea. very cool idea :) we’ve done them in the oven before but this would be so much fun w/ the kids! thanks for the awesome idea! .-= Jackie @ 3 Little Ones´s last blog ..Tommee Tippee Explora Feeding Products Review =-. I have never thought of trying this outside. We definitely have the heat here to try it out! Thanks for the great idea. 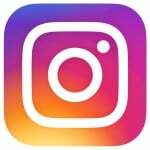 .-= Diana´s last blog ..On Trying New Foods =-. .-= MamaRuck´s last blog ..Clayton Quotes =-. This is such a great idea! I wonder if using an old muffin tin would help — the metal might store the heat more efficiently! I’d love to post a link to this idea on my blog with your permission — I’ll send you an e-mail! .-= Dee´s last blog ..Making Friends Monday =-. @Dee – I agree that an old muffin tin would work better. We didn’t have one and so substituted the cups. what a great idea! Better than using a mold in the oven! It’s so fun to see the power of the sun in action! I’m glad you love the idea, and thank you so much for sharing this post on your parenting page! Wow! I’ve made these in the oven, but wouldn’t have thought to use the sun! I love it! Thinking it would work in the hot car out in the sun. Just don’t forget about them! Something to try out soon. It’ll work much more quickly in the hot car! I think it was around 33C when we did this. Maybe you’ll get that warm one day? I was surprised we got it to work with it only being that hot. Try it in your car or greenhouse on a really hot day. Probably wait till the 6 weeks holiday to try it though. Although I bet we will have a rubbish summer anyway! Love the way your version turned out!